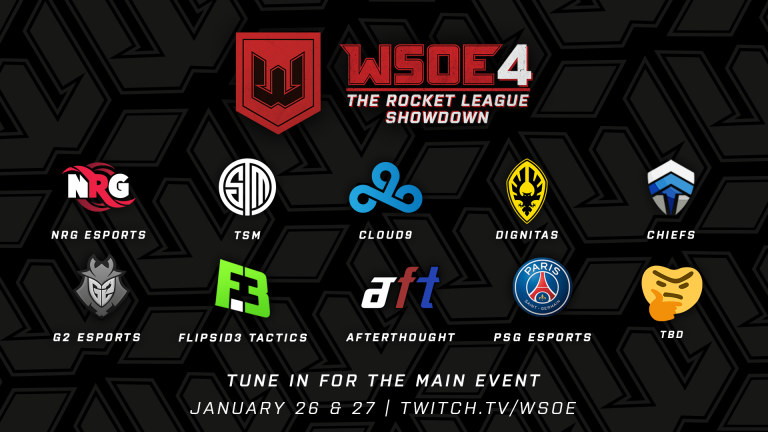 WSOE 4: The Rocket League Showdown is a $100,000 tournament featuring six invited teams from North America, South America, Europe, and Oceania, as well as four teams that qualified through open regional online tournaments. All ten teams will play live from the PokerGO Studios at ARIA Resort and Casino in Las Vegas on January 26 and 27 to see who will become the newest WSOE Champions and take home the $50,000 first prize! Take a look at all of the team rosters and give them a follow! Be sure to tune in to the stream beginning at 9:30 a.m. Pacific on both Saturday and Sunday at http://www.twitch.tv/WSOE and let us know what you think about the teams and tournament at http://www.twitter.com/WSOE! We’ll see you in chat!